Offering more than a mile of boardwalk across open water, vegetated wetlands and mudflats, this created wetland is just as spectacular as Wakodahatchee, only bigger! If you own a camera, make sure you bring it, as even amateur photographers can get great pictures here. 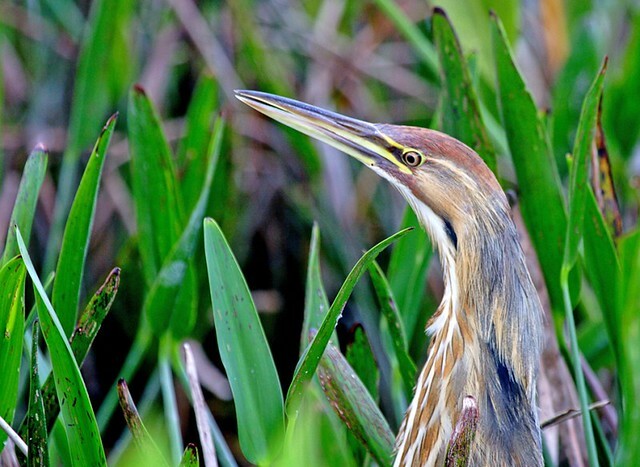 Many of Florida’s wetland specialties can be found at Green Cay; walk the boardwalk slowly, keeping an eye out for Black-bellied Whistling-Duck, Roseate Spoonbill, Least Bittern, Wood Stork, Yellow-crowned and Black-crowned Night-Heron, Blue-winged and Green-winged Teal, Purple Gallinule, and Limpkin. In winter, American Bitterns can be seen relatively easily. Wintering Painted Buntings can be found at the feeding station by the nature center, and be sure to check the Cypress Forest for migratory songbirds. There is a mated pair of Red-shouldered Hawks frequently seen flying around. From January through May, you may get lucky enough to see the Eastern Screech-Owls (male and female mated pair) that return every year. Over 250 different bird species have been spotted on the property. In 2015, a La Sagra’s Flycatcher wintered here! This family friendly site is a must visit. The nature center coordinates guided walks and classes and interprets the surrounding wetlands for visitors. Call ahead for more information. Loaner optics are available.